Our evaluation of the Alt-Berg Mallerstang Walking Boots took place in the Black Mount & Arrochar Alps (Scotland) and the Lake District's Coniston Fells in summer conditions. These areas contain rocky hills with scree, boulder fields, steep mixed ground and rough moorland. These boots are ideally suited for mountain walking and provide an excellent, stable platform on rough and steep ground. Distances were up to 13 miles with 3500 to 4000 feet of ascent. The boots did require a limited amount of 'wearing-in' over the first couple of walks but did not cause any major areas of friction. Altberg recommend the use of 'smart wool' socks and these were used in the boots for the Scottish walks and 'Hi-point' socks were used in the Lake District. The Lake District walks were undertaken in very wet conditions, including a river crossing and my feet stayed dry even though the boots had not been reproofed after use in Scotland. The boots provided excellent friction on some very steep grass and mixed scree/grass both in ascent and in descent and coped equally well with easy scrambling. My feet remained well protected throughout and there was no detectable movement of my feet within the boot on some extremely long and steep descents. The boots remained comfortable throughout, and became more comfortable with each walk. Crampons were not used although I did confirm that my Salewa 12-point crampons could be fitted and were secure. The lacing points have two locking points on each boot. I was unsure how these worked and there were no instructions or advice. The footbeds were useful and my feet did not overheat. During the river crossing, water entered both boots and I had to cover approximately three miles on woodland paths with wet feet. However, the boots remained comfortable and appeared to be dry inside at the end of the walk. The Alt-Berg Mallerstang Walking Boots are principally hill walking boots and have a stiffened midsole. They are designed for, and ideally suited to activities such as Munro-bagging, Lake District ridge walking and the like over 4 seasons. 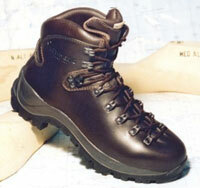 They are not 'mountaineering' boots per-se but walking boots for use in mountains. My opinion is that they would be too stiff and heavy for long distance trekking/backpacking - unless this was in a mountain area. The boots are extremely well made and, can be individually fitted at Altberg stockists using 5 boot width/volume fittings for each boot size. I fully expect them to last for several years, providing I look after them, and, given Altberg's boot repair service (e.g. complete refurbishment for around £50) the useful life of these boots will potentially be much longer. The initial cash outlay (£139.99) seems like an excellent investment.